Northern Virginia stair lift repair service area includes Leesburg to Alexandria. Local service for the following counties Loudoun, Ashburn, Leesburg, Fairfax, Great Falls, Arlington, Clarke, Winchester, Purcellville, Stafford and Fauquier. Call us at 866-721-6004 to schedule a chairlift repair in Northern Virginia. We also provide installation and stair lift removal services. Stairlift broken, making a strange noise or just need routine maintenance? If you’re looking for stair lift service call us at 866-721-6004. With over 25 years of experience we know chair lifts extremely well and can fix all current models. For professional, reliable service give us a call. Sometimes a stairlift repair is just a matter of a simple obstruction or key switch turned off. How to fix the most common stairlift problems and more. 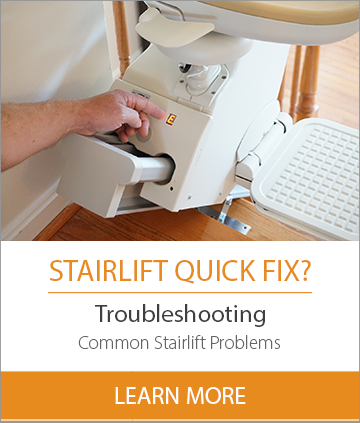 Free guide to troubleshoot common stairlift problems. Serving Northern Virginia, Maryland and DC.